Length of sight line 12.2" to 13.8"
The Morini CM 162Ml competition pistol features a Lothar Walther precision barrel based on Morini's concept for the ultimate in accuracy. It has factory installed anatomical adjustable walnut grips. The muzzle compensator eliminates barrel flip, and the 5.0 mm foresight comes standard. (4.0, 4.5, 5.5 and 6.0 mm are extra). The pistol has a matte black non reflective action body, and blued steel barrel with two different color cylinders for ease of identification and charging. Once charged to 3,000 psi, this regulated pistol boasts 200 guaranteed shots. Pressure gauges located on the front of the detachable cylinders allow for continued montoring of the available pressure. 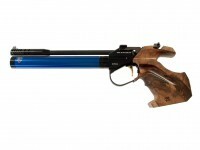 The adjustable trigger is mechanical with ball bearing and dry-fire mechanism, and factory set according to ISSF rules. Includes: Rigid carry case with red plush lining profiled for pistols and factory standard accessories - provision for match pellets & scoring gauge, charging adaptor (to standard DIN thread), all tools that might be required for stripping, and full instructions. Things I liked: This pistol a gem in every respect. Of course, it is very accurate and the ergonomics are many. The fact that it comes with two air cylinders was a selling point for me. The case is plush and comes with the essentials. The gun is beautiful and quality abounds. What others should know: The Morini is expensive but like they say: "you get what you pat for". I will be setting up a 10m range in my apartment and noise level is essential. 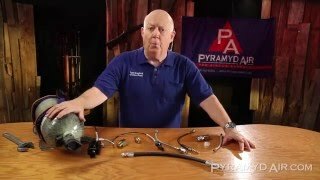 How loud is this when it is fired in doors? It pops pretty good. But whether or not it would be too loud for your uses, it's hard to say. Do you have left grips for this pistol? Where is this gun manufactured?